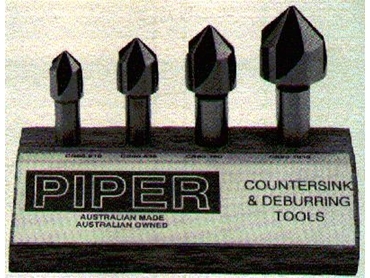 Piper Tools , manufacturer of machine tool accessories since 1937, offers the 4 Flute Countersink Cutter Sets. As part of Piper’s broad range or lathe centres, tapping chucks and cutting tools, the 4 Flute Countersink Cutter Sets deliver a smooth balanced cut in any material, ferrous or non-ferrous. Manufactured from high speed steel, these countersink cutter sets produce exact head diameter clearance for screws, rivets, etc, giving craftsmen like appearance to every job. • Specially designed flutes and cutting action effect considerable savings in operating times. • Available in sets or singles. • Indispensable as general chamfering and deburring tool. • All necessary angles available - 60,82,90,100 and 120 degrees.